Many of us get excited when hearing about cutting edge graphics cards, but let’s face it: performance and whiz bang features are pretty nice, but the majority of consumers simply will not swallow the high price tag that comes with it. The sales volume are actuallly in the low end region of the market, and that is why cards like the Radeon 9200 SE or GeforceMX still sell very well though they lack many important features. Today we take a look at what XGI has to offer for the value market. The Volari V3 XT sports some pretty nifty features such as full DirectX 9 and native HDTV support (!! ), making it rather unique as to my knowledge no other value card fully supports HDTV. The Volari V3 XT card comes equipped with 128MB of DDR memory. The V3XT GPU is clocked at 250Mhz. Let’s take a look first at the specifications of the card then get right into it.. The Volari V3 XT certainly seems to have some very interesting features (namely full HDTV support! ), especially for a mainstream card (the card should cost about $50 USD only). A good point to note is that the Volari V3 XT is the only mainstream card to feature a built-in thermal diode, ensuring the card runs properly at all times. As far as I know, ATI and nVidia only offer this feature on their high end solutions. TruShader™ Engine takes vertex and pixel shading to a new level of realism. With Trushader technology, 3D environments come alive with lush renderings that make your 3D game scene with haunting realism. Users can enjoy advantage of programmable DirectX9 effects that will turn your display imagery into a true work of art. The XGI Volari V3 XT offers full DirectX 9 support, giving you better support for all the latest games. Needless to say that you are going to get the best performance and image quality from a card that offers true DirectX 9 support, compared to competing solutions which do not offer such support. Not all processing environments are created equal. The blistering demands imposed by full screen 3D applications will tax your GPU for all it’s worth, leaving weaker processors in the dust. When it’s time to pour on the muscle, V-Drive is like a short of pure adrenaline in the heat of the battle. V-Drive™ ratchets up processing power in perfectly timed response to computational demands, effortlessly delivering full frame graphics with flawless execution. Shift in to V-Drive™ and experience the ultimate in high speed performance. V-Drive gives you the ability to get the absolute most out of your graphics card through an automatic overclocking of the card. This enables you to get the most performance out of your graphics card, without any hassle. While we’re talking about overclocking, it is important to note that the drivers have their own little setting for overclocking under the 3D settings area : in other words, you don’t have to go hunting around for a tool like Powerstrip to overclock manually. The XGI Volari V3 XT comes with quite a nice heatsink cooling the GPU without any noise, making the card silent. This makes the card a very good choice for those of you looking for a cool and quiet graphics card. Not to mention the fact that the card is pretty small in size. Volari™ V3XT processors feature XGI’s legendary Cipher™ video processor. Leveraging this advanced de-interlacing technology means video files play with a smooth, flicker-free and fluid motion that amazes even industry professionals. And unlike competing video processors, the Cipher™ video processor converts both incoming and outgoing video feeds, ensuring that all your videos are displayed with the highest possible on-screen quality. The Volari™ V3XT processor also feature XGI’s cutting-edge ColorAmp™ Engine – driven by a proprietary algorithm that analyzes on-screen environments and automatically optimizes color intensity and gamma levels to provide the most accurate on-screen color and display brightness. The Volari™ V3XT processor’s proprietary Intelli-Vision™ Engine makes calculated adjustments to display brightness when entering 3D mode, providing clearer and sharper graphics display performance ideal for today’s 3D gaming. Next to being a value DirectX9 solution, some high-quality video features have been included in the Volari V3 XT. The 2D image quality of the Volari V3 XT is surprsingly crisp and clear, and video playback is excellent. XGI’s ColorAmp Engine is an on-the-fly color and brightness optimizer for 3D and 2D, providing extra saturation for onscreen colours and brightening 3D images to increase viewability. This is done through a set of custom settings for various sources, such as DVDs and games. Of course, user customization is possible as well. The Volari V3 XT features the Cipher Video Processor which uses an advanced proprietary pixel-based deinterlacing algorithm for rendering high-quality video. 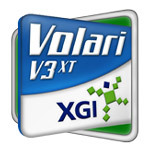 Harness the superior power of the any Volari™ V3XT processor with XGI’s Reactor™ unified driver. Packed with useful features and fully compatible with Direct3D and OpenGL APIs, the Reactor™ unified driver allows an advanced level of processor-tuning that easily meets the demands of today’s avid gamers. The Reactor™ unified driver works across all graphics boards incorporating Volari™ V3XT processors, making driver management virtually effortless. It is a good surprise to see that XGI has adopted a unified driver system : no matter which XGI card you have, you won’t run into any problems hunting down the right driver as there is only one. Also, if you already own an XGI card, you simply need to take out the card and pop in the new card without having to go through installation again. How easy can things get? This is definitely a bonus for the consumer and reseller as it reduces customer confusion. PowerManager – PowerManager provides real-time GPU temperature detection and monitoring : this allows you to check at a glance the temperature of the GPU as well as the voltage of the GPU and the memory. Rotech – Rotech (which stands for “Rotation Technology”) offers you the ability to rotate your desktop with your monitor. This is interesting for those of you who own a monitor which can be tilted. Navigator – Navigator unleashes the possibilities of small monitors : it allows you to zoom in on any part of the screen you want. It shows the position of the current physical screen in the entire virtual desktop area. You can also use this application to move the physical screen to wherever you wish. Let’s take a look now at the performance of the Volari V3 XT. A note on testing: the only card available from ATI which is about the same price range is the Radeon 9200 SE, that is why the card was chosen to compare with the Volari V3 XT. The Geforce MX 4000 is in the same price range as the Volari V3 XT, but its performance is much lower than both the V3 XT and the 9200 SE. Also, the Geforce MX 4000 lacks DirectX 8 support (no pixel and vertex shader support). In 3D Mark 2003 and Aquamark 3, the card shows its power thanks to its DirectX 9 support and outperforms the slightly more expensive Radeon 9200 SE. In 3D Mark 2001 SE, the card is neck to neck with the ATI Radeon 9200 SE. The Final Fantasy Benchmark and X2-The Threat result shows the Volari V3 XT falling slightly behind the Radeon 9200 SE only. The gap between the two cards seems to widen a bit in OpenGL, as shown in the Quake 3, RTCW and Enemy Territory. It seems the Volari V3 XT could use some extra driver tweaking, especially for the OpenGL driver, to catch up with the 9200 SE. The Volari V3 XT is a very interesting piece of hardware for the maistream/value market. It may not be the fastest mainstream card available, but then again I don’t think it makes much sense to look for the “fastest card” when looking under $50 USD / 50 euros price range. Those looking out for pure performance would be looking at higher end models. Nevertheless, the Volari V3 XT performance is good, and it came very close to the 9200 SE. A point which is very important is image quality, and the Volari V3 XT did not disappoint. Image quality is excellent, 2D and videos are surprisingly clear and sharp even in high resolutions, slightly better (clearer and crispier) than the 9200 SE in my opinion. Video playblack certainly is one of the strong points of the Volari V3 XT, not to mention the V3 XT has an ace up its sleeve which makes it a very tempting option for home theater PCs : full HDTV support. As we mentionned, the Volari V3 XT is also able to display HDTV resolutions through the card’s TV-Out. This explains why the card’s TV-Out quality is simply excellent and far better than any competing solution. Given that ATI’s HDTV component adapter required for HDTV costs $30 USD all by itself, HDTV display could become Volari’s domain. The home theater crowd may also appreciate Volari’s shader-powered video engine. I certainly did as it greatly enhanced video playback quality. At the end of the day, XGI has produced a very capable and competitive value offering in the Volari V3 XT. It may not be the fastest low-end gamer on the block, but is certainly the only one that’ll do HDTV display right out of the box.